Super Smash Bros. director Masahiro Sakurai has teased another interesting bit from the upcoming Super Smash Bros. games, this time electing to show off a cameo character known from the classic arcade shooter Galaga. The character in question is Boss Galaga, who is infamous for trying to pull the player’s ship in with its tractor beam and double its power. Boss Galaga will do the same thing in Super Smash Bros., though this time it will just lift you up off the screen. 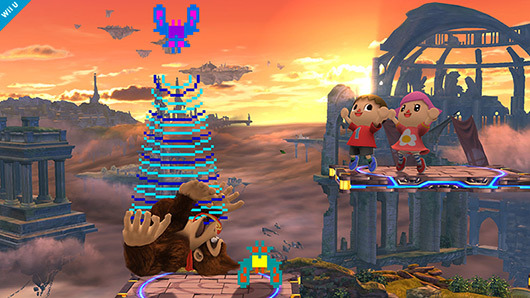 Super Smash Bros. is set to release for the 3DS on October 3rd and the Wii U by the end of the year. This entry was posted in 3DS, All, Featured, News, Wii U and tagged Boss Galaga, Galaga, Super Smash Bros. on July 31, 2014 by Mike Guarino.